Black patent leather bootie size 7. Worn Once, Excellent condition. Betsey Johnson Floral Dress Size 10. New, Never worn. 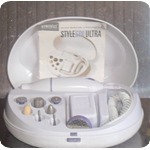 New, Never used manicure/pedicure kit by Homedics. Jones NY color block dress size 6. New Never Worn. 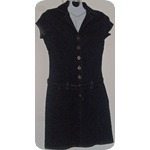 Belted stretch denim mini-dress size 6. Worn Once. Excellent condition. 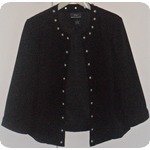 Size M. Black studded blazer with elbow length sleeves and crop waste. New Never worn. 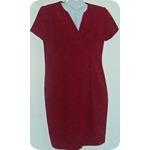 Cranberry Liz Claiborne Dress. V neck. Short Sleeve. Size 8. Excellent condition. Exquisite beaded dress with black and gold details. Plunging V-back and back slit. Excellent condition. Never worn. Black Vintage hat from 40's or 50's. Mint Condition. 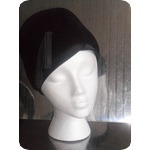 Body of hat made in Italy. Tagged as designed by Phyllis, New York. 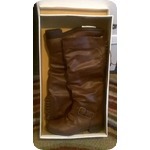 Brown, wide-calf, Knee-hi boot size 7.5. New never worn. Adjustible side buckle and lace-up bag. Pink bling sandal. Fuscia satin blinged out with hot pink stones and stretch straps. Size 7. Excellent condition - worn once. If you want attention, you got it in this sizzler. 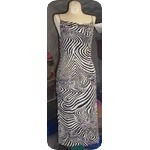 This one size fit all dress will hug your body size 4 - 10. Stretch material with sequined look bling and daring string back. 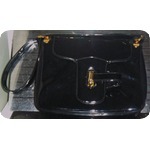 Excellent condiiton - never worn. 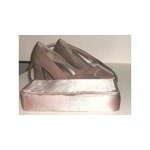 Taupe color Satin heel and purse. Great for wedding or function. Size 7. Excellent Condition - Used once. 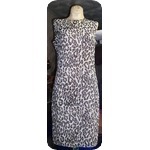 Evan Piccone Chettah print dress. Sheer Crepe look fabric over a tan built in slip. Gorgeous Dress. Size 4. New-Never worn. Vintage 70's Halter Jumpsuit. 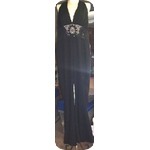 Size 7 Black Stretch fabric with palazzo leg. Lace waist and lace border on tie. Excellent Condition. August Silk Petite orange silk dress. Size 4. 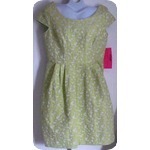 Dress has detailed topstitching and kick pleast in back. New - Never worn. 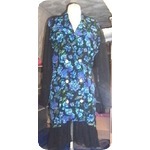 Silk-look Floral print dress with black sheer sleeves and bottom ruffle. Fake breast pocket and round pearlized buttons. Size 5 - new never worn. 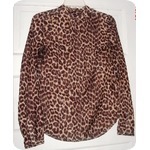 Ann Taylor faux silk cheetah print blouse size 2. 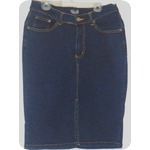 Cargo style with buttoned shoulder tabs and front flaps. Roll up sleeves with button and tab. Condition is like new- worn once.